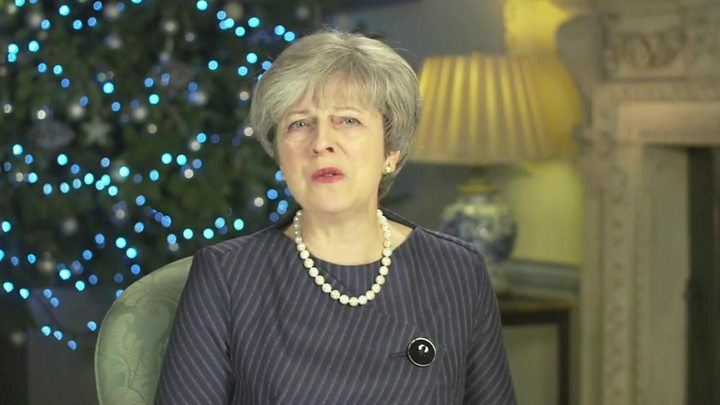 The prime minister has used her Christmas message to the armed forces to pay tribute to the "valiant hearts" of British servicemen and women who are working to keep the UK safe. Theresa May said the RAF, and soldiers training and supporting Iraqi forces, have helped tackle the threat of the so-called Islamic State group in 2017. And she referenced troops on UK streets after terror attacks. She praised the sacrifice of those who could not be home for Christmas. Mrs May also paid tribute to the Royal Navy for helping to bring disaster relief to people in the Caribbean in the wake of Hurricane Irma. Mrs May began her message by referring to the centenary commemorations for the World War One battle of Passchendaele in Belgium. She said the nation remembered the hundreds of thousands of young men who died "in the cause of freedom". "Through a century of great change since, the high standards and devotion to duty of our armed forces have remained constant," she said. The prime minister added: "Whenever you are called upon - regulars or reserves - you always give of your best and inspire us all with your service." But she said the achievements of the armed forces were "made possible by the love and support of your families". "Partners and children are often called on to make huge sacrifices of their own - from a change of school or job, to coping with extended periods of separation," she said. "That separation is especially difficult at Christmas time, and we should all be immensely grateful for that sacrifice." She added: "This Christmas, as people across the United Kingdom celebrate this special time of year with their families and friends, we will do so secure in the knowledge that the valiant hearts of our servicemen and women, many far away from their own loved ones at this special time of year, are working to keep us safe." On Friday, Mrs May visited troops at the RAF base in Cyprus, where operations against IS have been launched, and last month she met UK military personnel stationed in Iraq.